What is Startup Weekend? A unique opportunity for developers, designers, entrepreneurs, & changemakers to team up & build new social enterprise startups in just 54 hours! Startup Weekend is part of the largest entrepreneurial community with 80,000 past attendees, 905 weekend events, 501 cities, and 135 countries since 2014. Rapid-fire startup pitches, prototype building, customer development, mentor feedback from experts, & a Shark Tank-style judging session! We're focusing on Sustainable Solutions and Social Impact to encourage cross-pollination of communities within Santa Cruz County. Join folks with different interests, areas of expertise, and passions to share, create, & get feedback on ideas that will change the world for the better. Those with a startup idea get 60 seconds to pitch it (not required), attendees vote for their favorites, and teams form around the top ideas! Days 2-3 involve collaboration as teams take their ideas from paper to working prototype, including interaction with potential customers. This is event is co-sponsored by the UCSC Sustainability Office, Santa Cruz Works, City of Santa Cruz Economic Development Office, Santa Cruz Tech Beat, and the UCSC Everett Program. Learn more about our sponsors and how to become a sponsor at tinyurl.com/swsc16. Tickets are limited to 100, prices vary, and ticket cost will increase as the event date nears. 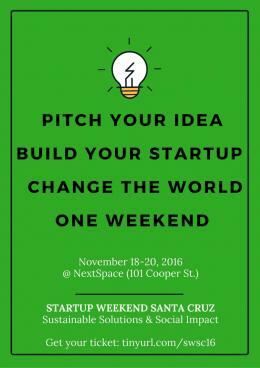 For information about limited scholarship/reduced price tickets, please email santacruz@startupweekend.org.